Chris James Thompson, Nohl fellow from 2010 in the Emerging category, and Detective Pat Kennedy talk about Thompson's film, The Jeffrey Dahmer Files, on CNN. Take a look here. 2012 Suitcase Fund recipient Marsha McDonald has added an artist talk with poet, photographer and "high Sierras mountain man" Tinker Greene as part of her exhibition at Chandler Fine Art in San Francisco. More information on the exhibition here. 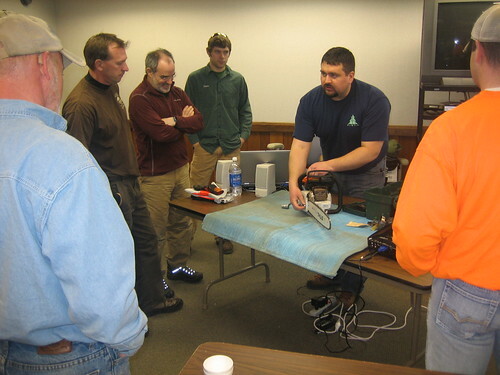 Bob Retko, senior grounds manager and author of From the Wild Side, a recurring feature on this blog, organized a Basic Level Chainsaw Safety Training Certification class at the Village of River Hills meeting room. 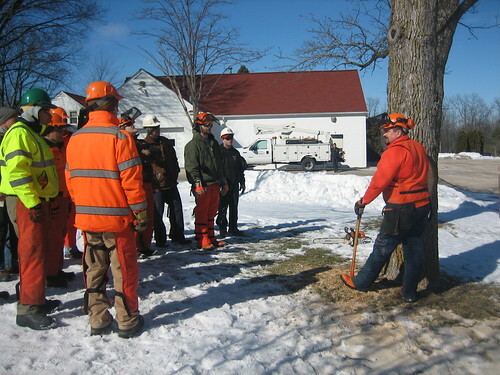 The class, which was organized in conjunction with the Forest Industry Safety Training Alliance (FISTA) from Rhinelander was led by Ben Parsons. 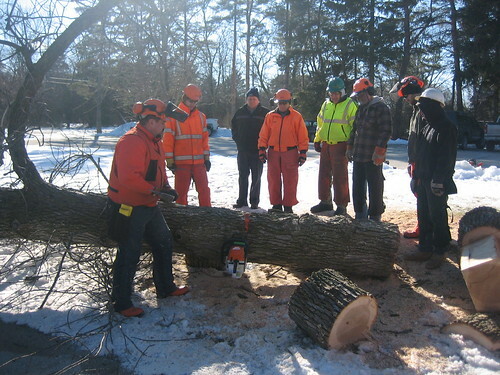 Twelve participants learned basic chainsaw safety techniques from 7 am until 3 pm. See below for some pictures from the training session. A (couple days) belated "Thank You!" to everyone who organized, attended and participated in our 3rd Annual Winter Carnival. Howard Leu of ThirdCoast Digest took some excellent pictures, which you can see in a slideshow, here. MKE< - >LAX in collaboration with Watts House Project and Otis College of Art and Design's Graduate Public Practice and Artists, Community and Teaching programs present film screenings with Milwaukee-based filmmaker Brad Pruitt in Watts and Culver City. Documentary video screening on U.S. educational system with Brad Pruitt and Mark Escribano, facilitated by Sara Daleiden. Documentary video screening and spoken word performances with Brad Pruitt and Mark Escribano, facilitated by Sara Daleiden and Watts House Project. Pruitt's latest documentaries Bending Towards the Light and Mark My Words will be screened and include a discussion with the filmmaker and performances by local artists. Sara Daleiden, director of MKE< - >LAX and faculty for Otis’ Graduate Public Practice Program, will facilitate these discussions. Mark Escribano, a Los Angeles-based filmmaker and cinematographer, previously from Milwaukee who worked on the film, will participate. Pruitt will also co-teach a course with Daleiden at Otis’ Graduate Public Practice Program that focuses on education, community engagement and the value of social change work by artists. 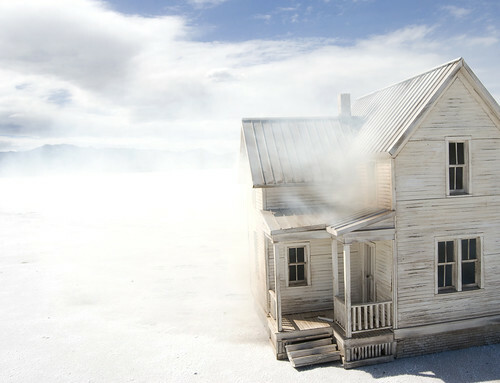 Pruitt is in residence with MKE< - >LAX from January-March 2013 in Los Angeles. As part of his residency, Pruitt will promote these recent documentaries, and seek support for his new film, Behind Closed Doors. As an Emmy award-winning filmmaker and artist, Pruitt explores issues such as gun violence and new approaches to public education, finding new voices and ideas to help develop solutions for seemingly intractable challenges. Inspired by the renaissance of spoken word at home and around the world, Mark My Words is a remarkably poignant feature that documents 24 hours in the lives of some of the nation's most talented poets. The film is a visual gumbo of performances, home lives, day jobs, families, and daily routines, seasoned by the poets' unique perspectives on the power of words. Pruitt's latest documentary, Bending Toward the Light, explores U.S. educational systems through students, parents, teachers, reformers and activists in our country's heartland. This documentary examines the challenges as well as hopes of youths and adults who are transforming the state of education. For more information about the program and these special events, please contact Consuelo Velasco Montoya at 310-846-2610 or publicpractice@otis.edu. This screening series is part of Otis’ Concentric Conversations series, which prompts discourse among cultural practitioners based in Los Angeles. 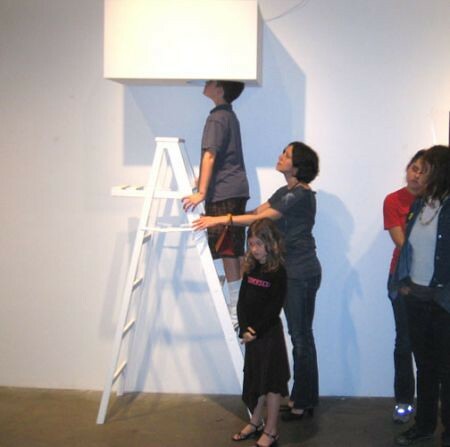 Otis has the only educational program in the Southern California region dedicated exclusively to providing artists with advanced skills for working in the public sphere, focusing both on collaborative and individual art production. Applications currently being accepted for Fall 2013. Watts House Project is an artist-driven neighborhood redevelopment organization through which artists and design professionals, in collaboration with the Watts Towers area residents, employ art as an economic and community development engine to promote and enhance the quality of residential life in the Watts neighborhood. WHP brings residents together in a creative partnership with artists, architects, design professionals, and volunteers to revitalize the neighborhood and re-imagine the environment through inventive programming, community involvement, and functional and creative housing renovations. MKE< - >LAX investigates cultural exchange, through residencies and public programs, between Milwaukee and Los Angeles. Under the direction of Sara Daleiden, the initiative expands the discussion about cultural exchange across regional boundaries. MKE< - >LAX moves between regions to pose questions about the influence that location, size, market, cultural values and other regional factors have on the arts and cultural identity. MKE<->LAX, please contact Sara Daleiden at info@mke-lax.org or visit www.mke-lax.org. Thank you to the Milwaukee-based Mary L. Nohl Suitcase Export Fund for the generous support. 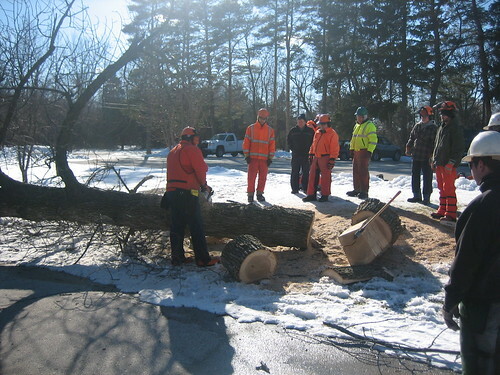 2011 Nohl Fellow Brad Lichtenstein has released BizVizz, an iPhone app inspired by his documentary As Goes Janesville. You can learn more about BizVizz and purchase the app at http://bizvizz.com. Congratulations to the recipients in the 2012 December Cycle of the Greater Milwaukee Foundation’s Mary L. Nohl Fund Suitcase Export Fund. The fund provides support to greater Milwaukee artists who are exhibiting or screening work outside the immediate four-county area. This group of artists will be taking work to Miami, Los Angeles, Delaware, San Francisco; Johannesburg, South Africa; Jeonju, South Korea; Izmir, Turkey; and Tokyo, Japan. The June Cycle opens June 3. Nathaniel Stern: Stern will travel to Johannesburg, South Africa for “Dynamic Stasis,” a collaborative solo exhibition (with Jessica Meuninck-Ganger) of new works at GALLERY AOP, featuring 14 new print and video works, a catalog, an artist talk. Stern and Meuninck-Ganger will also undertake several workshops in collaboration with the University of Johannesburg. 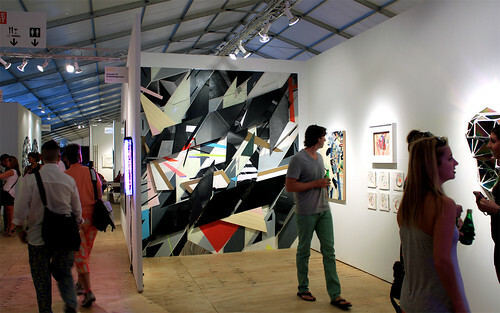 Eddie Villanueva: Villanueva will be exhibiting a large wall installation at SCOPE Art Fair in Miami. 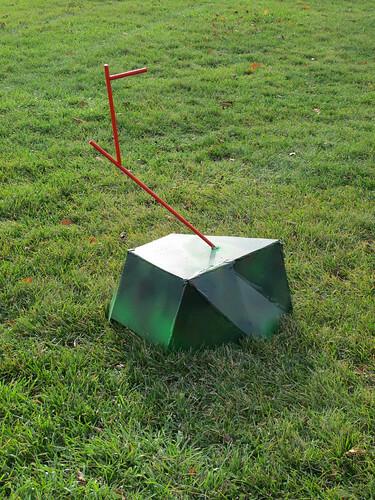 The installation will be a part of Circuit 12 Contemporary's booth. Shana McCaw & Brent Budsberg: To show video installations and large-scale photographic prints from their series "States of Matter" at The York, a bar/restaurant in Los Angeles, programmed by Culture Reference, a curatorial project based in Echo Park. "States of Matter" depicts a 19th-century Midwestern farm couple struggling with the unfamiliar landscape of the American West. McCaw & Budsberg will participate in two residencies while on the west coast: one at Goldwell Open Air Museum in Beatty, NV, the other at MKE-LAX in Los Angeles. Nicholas Grider: Grider will travel to Los Angeles for "A Public Drowning," a solo installation/performance involving photographs and text, a reading given in a private swimming pool, and a collective reading of a performance text. "A Public Drowning" is organized by Bellyflop Gallery in Los Angeles. Brad Pruitt: To screen and discuss his recent documentary, "Mark My Words," in the Watts neighborhood of Los Angeles. The event, hosted by the Watts House Project (an artist-driven neighborhood redevelopment project) in collaboration with the Watts Art Center, Otis College of Art & Design and MKE-LAX, is designed to highlight art and media as a resource for social change and community engagement. This is the first public screening of the film in LA. Pruitt will also co-teach a workshop on public education and community organizing for public practice artists and will screen "Bending Toward the Light" at Otis. Special Entertainment: Special Entertainment will screen and discuss a selection of their work -- past, new and in-progress -- at Actual Size Gallery in Los Angeles. They will have a simultaneous residency at MKE-LAX, during which they'll be shooting footage for a feature film. 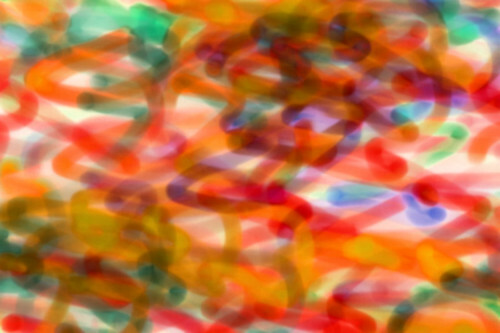 Nirmal Raja: Raja will show works including a 15' x 5' stiff fabric quilt and 10 print/mixed media works as part of a group show at the Gyodong Art Center and Gyodong Studio Gallery in Jeonju, South Korea. The exhibition came as a result of a study trip a group of six Milwaukee artists made to South Korea last year to learn about hanji, the traditional Korean craft of making and manipulating paper. 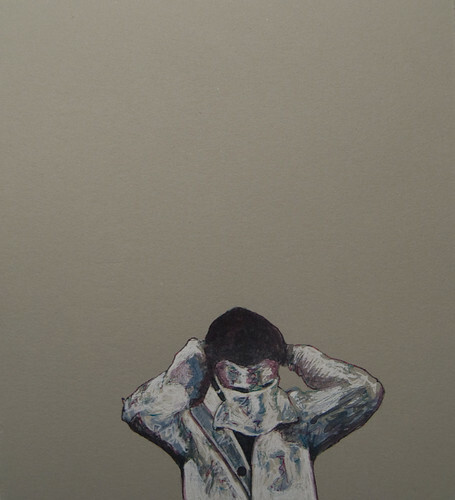 Yevgeniya Kaganovich: For a solo exhibition at the Heidi Lowe Gallery in Rehoboth, Delaware. Lowe seeks work that transcends traditional thinking about jewelry and focuses on alternative materials. Kaganovich will be showing work from the "Pearl Clasp Necklace" series, which utilizes altered images of a traditional pearl clasp and porcelain “pearls” covered with a glaze that incorporates crushed fresh water pearls. The clasps flatten, inflate, gradate and deform, losing their original function and becoming decorative elements; the combination of porcelain and pearls creates a new precious material. Marna Brauner: Brauner will travel to Jeonju, South Korea to participate in a group show at the Gyodong Art Center and Gyodong Studio Gallery. The exhibition came as a result of a study trip a group of six Milwaukee artists made to South Korea last year to learn about hanji, the traditional Korean craft of making and manipulating paper. Brauner will be making 6 new pieces to be hung on the walls. 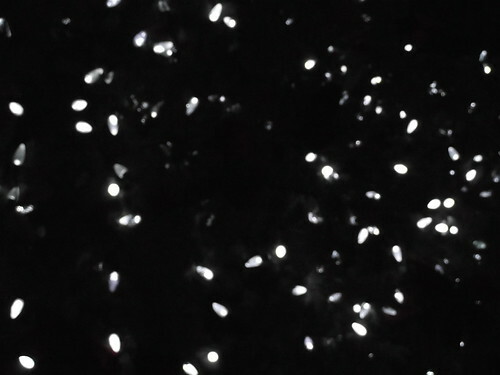 While in South Korea, Brauner will lecture at the gallery and at Jeonju Kije College. Marsha McDonald: For a solo exhibition of recent work-- paintings, drawings, and small bronzes on the theme sort vand or black water at Chandler Fine Art in San Francisco. McDonald will give a gallery talk as well as a public lecture. Jessica Meuninck-Ganger: Meuninck-Ganger will travel to Johannesburg, South Africa for “Dynamic Stasis,” a collaborative solo exhibition (with Nathanial Stern) of new works at GALLERY AOP, featuring 14 new print and video works, a catalog, an artist talk. 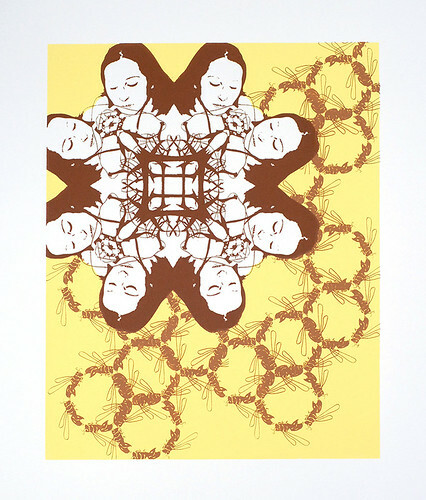 Meuninck-Ganger and Stern will also undertake several workshops in collaboration with the University of Johannesburg, and Meuninck-Ganger will meet with Kim Berman at Artist Proof Studio to coordinate an exhibition of South African prints for the "Print:MKE" conference in March. 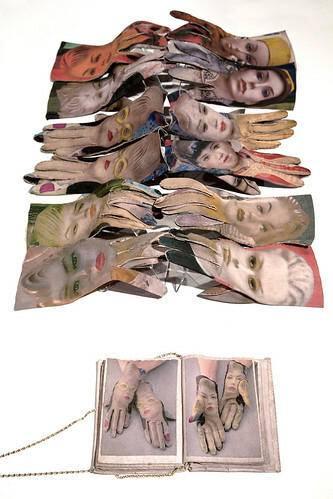 Tonia Klein: To ship 4 mixed media collages, 2 screen prints and a site-specific installation to Izmir, Turkey for a solo exhibition at FLASH Atölye, an independent nonprofit project and exhibition space. Rina Yoon: Yoon will travel to Jeonju, South Korea for a group show she has curated at the Gyodong Art Center and Gyodong Studio Gallery. 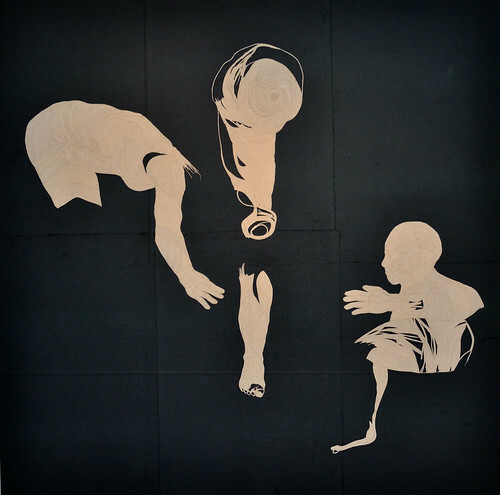 The exhibition is the result of a study trip Yoon led last year of six Milwaukee artists to South Korea to learn about hanji, the traditional Korean craft of making and manipulating paper. 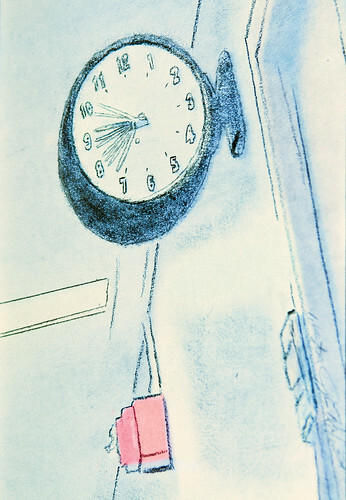 John Riepenhoff: To open a John Riepenhoff Experience at a new Lucie Fontaine Gallery in Tokyo. The John Riepenhoff Expierence will be in place for at least a year, and exhibitions will change quarterly, beginning with miniature paintings by Los Angeles artist Jeni Spota. From Tokyo, Riepenhoff will travel on to Bangkok to arrange a solo plein air exhibition at Ver Gallery. 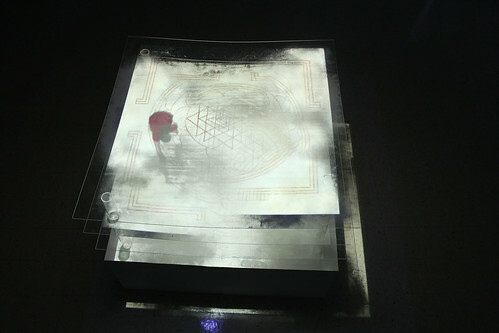 Victoria Tasch: Tasch will travel to Tokyo to exhibit altered and handmade books with screen printed pedestals in the group show, "Distant in Geography, Close in Mind" at the Bumpodo Gallery. Zina Mussman: For a solo exhibition, “Under the Sun,” at the Lane Community College Art Gallery (Sister Gallery) in Eugene, Oregon. 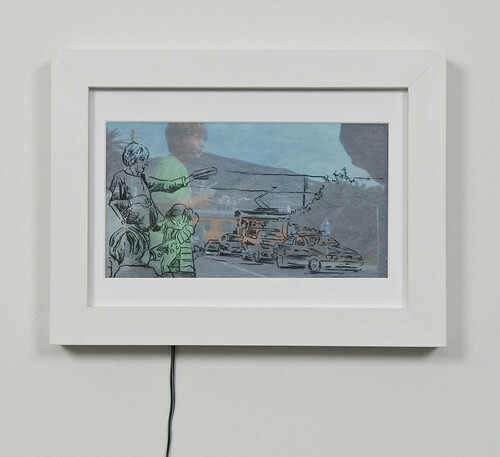 Mussman will be showing 28 recent mixed-media drawings. Barbara Miner, a 2008 Nohl Fellow whose photo essay, Anatomy of an Avenue, documented North Avenue from the Milwaukee lakefront to the town of Pewaukee, has published a book, Lessons from the Heartland: A Turbulent Half-Century of Public Education in an Iconic American City. You can join Miner for a book launch at Boswell Books on Friday, January 25 at 7 pm. More info at http://www.boswellbooks.com. 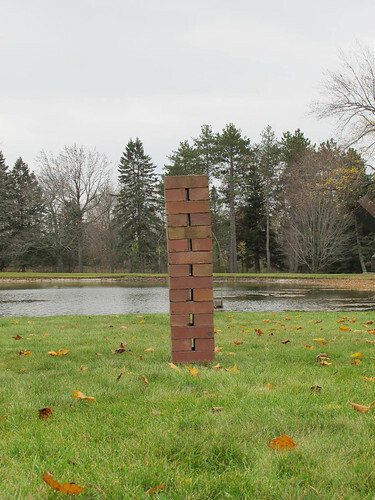 Current Established Nohl fellow Faythe Levine will be showing Getting By in the Foreverscape: New work by Colin Matthes at her Sky High Gallery in Milwaukee, January 18-March 10. Colin Matthes is also a current Nohl fellow in the Established category. 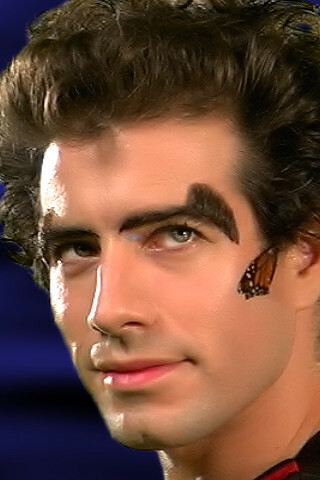 For more information on the show, click here. Both Levine and Matthes were previously awarded Nohl fellowships in the Emerging category in 2007. From the Wild Side is a new, regular feature on our blog. Author Bob Retko has been on the staff at Lynden since 1966. This winter the ice formation on most bodies of water in Wisconsin was painfully slow and unpredictable. The three inches required to safely hold a human came to Lynden’s ponds in early January, about a month later than average. It is the clear first ice that allows us easier access to clear out and store the sculpture garden’s two wood duck nest boxes. If you have walked around the Big Lake you may have seen one weathered cedar nest box fixed to a pipe among the white cedars on the water’s edge at the east bay. The second is located across the road to the north in the much smaller Lily Pond. We haven’t been keeping records, but those two nest boxes have been in the same location for well over 20 years. Each spring they play a central role in the courtship and breeding of “woodies” at Lynden. There is a good chance that you may see mallard ducklings throughout the spring and summer on the waters here. Since mallards are for the most part ground nesters, a mallard hen’s biggest concern is finding adequate ground cover to avoid the multitude of predators so that she can bring off a successful clutch of eggs. Should she be successful, she and her brood might stay on the open ponds all summer. Wood ducks, on the other hand, are cavity nesters and while they may face less of a threat from ground predators, the availability of suitable nest cavities may be a limiting factor. Wood ducks prefer to spend most of their time on wooded creeks and sloughs rather than on open water. As a result, you would be very lucky to see a more secretive wood duck hen with her brood at Lynden. Most wood duck broods hatch around Memorial Day and are taken by the hen to brushy waterways after a day or two. 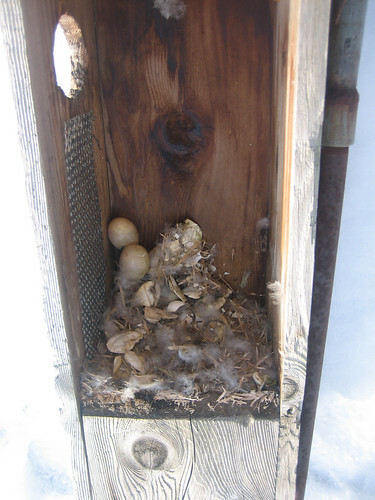 If you are interested in erecting wood duck nest boxes to attract waterfowl, you need to commit to maintaining the boxes each year to improve the occupancy rate and nesting success. At Lynden, we have mounted our boxes on steel pipes over water. 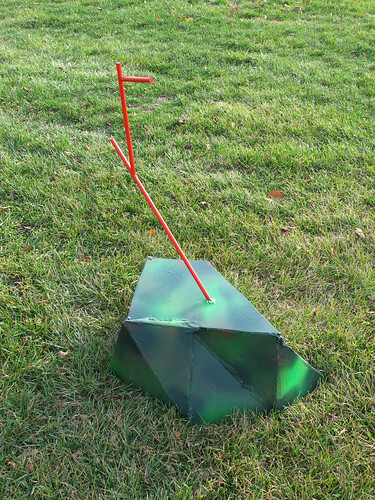 This greatly reduces the chances of predators such as squirrels, opossums and raccoons gaining access. 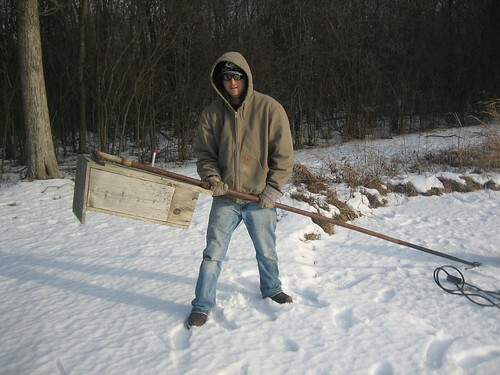 When the ice forms in early winter, we pull the nest box and the pipe from the lake bottom, open the nest box and check for hatched eggs, and clean out the nest cavity. 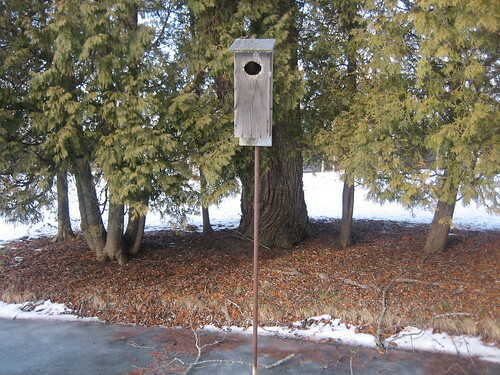 Removing the box in winter also prevents squirrels from using it to raise their young just prior to the arrival of the wood ducks in early April. Once cleaned, the nest box is stored. The boxes are filled with fresh wood shavings and reinstalled as the honeycombed old ice of winter recedes in the spring. We've already covered artist Colombe Marcasiano's residence at Lynden here, here and here, and now we wanted to share with you pictures of the temporary installations she's left behind now that her residency is over. 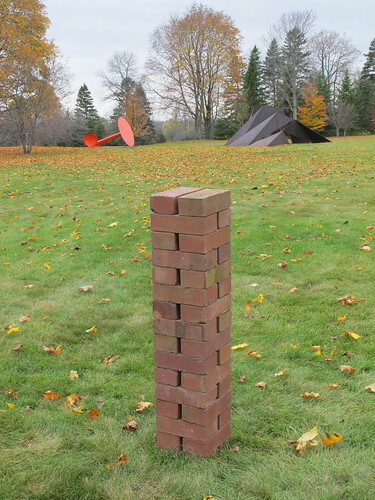 You can, of course, see these works in person at the garden!